Get ready to blaze new trails and conquer exciting adventures with the capability of the 2018 Jeep Wrangler. 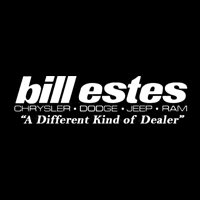 Here at Bill Estes Chrysler Dodge Jeep Ram, we are thrilled to offer this model as part of our showroom, and our friendly staff would love to help you get behind the wheel as soon as today! Come and see what makes us a different kind dealer, starting with our commitment to earning your trust, respect, and your loyalty through our attentive customer service. As one of the original Jeep models, the Wrangler is a true classic that is sure to attract attention wherever you go. From the signature seven-slot grille to the circular headlights and rugged front bumper, this is one crossover that looks as good at your campsite as it does when you are grabbing a cup of coffee downtown. Match the exterior to your personal style with colors like Xtreme Purple, Firecracker Red, and Rhino Clear-Coat Blue. You’ll also be able to add accessories, such as LED headlights, frame-mounted tow hooks, and the ability for open-air freedom with a removable top1. Propelling you forward in the 2018 Wrangler is a powerful 3.6L Pentastar® V6 engine that cranks out 285-hp and 260 lb.-ft. of torque while maintaining an efficiency of 17/21 MPG city/hwy2. If you want to kick it up a notch, equip one of the available 4×4 systems. With several different trim levels and packages, such as the Trail Rated® Rubicon, you’ll have the kind of capability and performance you need for all kinds of travels. You can also choose the available 2.0L 4-cylinder turbo engine that achieves a spirited 268-hp and 295 lb.-ft. of torque while mated to an 8-speed automatic transmission. Just because you want to embrace the great outdoors, doesn’t mean you should have to settle for a bare-bones cabin. The Wrangler is ready to surprise you with a welcoming array of optional features, such as heated front seats, a heated steering wheel, leather-trimmed upholstery, dual-zone automatic climate control, and more. Keep track of your route and stay connected with the Uconnect® 4C NAV system that includes an 8.4-inch touchscreen display. Crank up your tunes with the optional 8-speaker premium audio system that includes a weatherproof subwoofer for when unexpected climate conditions arise. Along the same line, you can also equip a weatherproof push-button start. Here at Bill Estes Auto Group, our mission and vision are at the forefront of how we do business. Come and see for yourself by visiting us at 745 E 56th St. in Brownsburg, IN, and ask about the 2018 Jeep Wrangler for sale in Brownsburg, IN! We can’t wait to tell you more about what this model has to offer and our ongoing incentives! 1 Be sure to follow all instructions in owners manual for removal of top, doors and lowering of windshield. 2 EPA estimated mpg with 3.6L engine and five-speed automatic transmission. Actual mileage may vary.